This is a fantastic recipe that I adapted from the Cook's Illustrated Cookbook. I was looking for a new family favorite to rival my Cumin Chicken recipe, and this came darn close. The flavors in this recipe blend together very nicely and don't overwhelm the flavor of the chicken. Everyone in our family enjoyed it. We served it with roasted new potatoes, which I added to the roasting pan when I put this in the oven. If you're looking for a new roast chicken standby, this could be it! If you're not comfortable roasting vertically, you can certainly try it with a normal roasting pan. I'd still recommend finishing at 500F, as that gives the chicken skin a nice browned and crispy taste. Process everything but the chicken in a blender or food processor to a smooth paste. 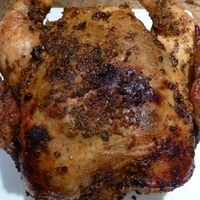 Loosen the skin on the chicken gently by sliding your fingers underneath the skin on the breasts and thighs. Spread about half of the paste under the skin, then spread the remainder outside the skin, using your fingers. Put the chicken in a bowl and cover with plastic wrap or put it in a 1 gallon zip lock bag. Leave at room temperature for 2 hours, or refrigerate for 6 up to 24 hours. Adjust oven rack to lowest position and pre-heat to 335F. Place a vertical roaster on the roasting pan or rimmed baking sheet. Slide the chicken on until the drumsticks just touch the pan. If you don't have a vertical roaster, use a 12 ounce beer can with half the beer either removed. Spray the can with cooking spray and slide the chicken over the beer can similarly so that the drumsticks just touch the pan. Roast until the skin is golden and the breast is 140F, about 50-60 minutes. Remove the pan from the oven. Raise the oven temp to 500F. When it reaches that temperature, put the chicken back in the oven, with 1 cup of water added to the roasting pan, and roast for about 20 minutes until the skin is crispy and the breast registers about 160F. If the top of the breast becomes to dark or smokes, you can add a piece of aluminum foil over the top to prevent further browning and you can add more water to the pan if it starts to smoke. Remove the pan from the oven and let the chicken rest, vertically, for about 15 minutes. Then remove from the rack to a carving board, carve and serve. We served with Aji, a traditional Peruvian yellow pepper sauce. If you don't have this, and want a spicy sauce to serve with it, consider mixing a red chili sauce like Sriracha with an equal amount of mayonaise or yogurt. Our whole family really enjoyed this recipe. It's very flavorful and not over powering. Looks very tempting. Will try it out. This looks fantastic John. I would love to add it to either of my cooking sites. I would love you to check both out as they have changed. Will do Polly. Thanks for sharing the links. This looks great. I would want to try and follow this recipe and have a nice roast than the usual I make. Hope i pull this off good, thanks for sharing! John, I'll have to try your version. The Cooks Illustrated recipe is one of my favorites. It's an credible flavorful roast chicken . Had your Cumin Chicken last night with a big pot of rice to soak up the dripping. Cumin Chicken Soup tonight! John, I'll have to try your version. The Cooks Illustrated recipe is one of my favorites. It's an credible flavorful roast chicken . Had your Cumin Chicken last night with a big pot of rice to soak up the dripping. Cumin Chicken Soup tonight! Thanks for the great comment Farrell. Glad you like the Cumin Chicken as much as I do and hope you enjoy this variation on the Peruvian Chicken! I've been looking for a good chicken alternative and this just might be it. I'll give it a try in a week or so when we sort out our menus again. Hope you enjoy this MT C. Please rate it if you do try it!